The show's promoter June Troy explained that she tried to get a date later in the month but there wasn't one available that would allow for the dealers to do their set-up the night before. All the Fridays were booked. Still, I'm encouraging her to seek a date later in the year, perhaps late April early May, a date that will take us out of the snow storm season. We had a fairly decent show but a still a sharp drop from previous years. While cataloging my library (yes, I have way too much time on my hands, but I found a great program to do it for me, it scans the bar codes and enters all the data...), I found a book on my shelf. This is the book that started it all for me. Published in 1975 by Caterine Milinaire and Carol Troy (no relation,) it is, on rereading, both so dated and so very current, kinda what vintage itself is. Although I'm really not so sure what vintage means anymore, and I don't care. As long it's an appreciation of yesterday, I'm happy with that; whether yesterday is 10 year old designer, 1980s haute, 1950s western or 1890s Victorian. I'm just happy that it's being found, sold, collected, worn, mixed and matched with Gap or Chanel and that it's not ending up in the landfill. You can still find this long out of print book around if you keep your eyes open, I've seen prices anywhere from the $20.00 to $200.00 range. I'd stick closer to the twenty, It's CHEAP chic we're talking about here, after all. 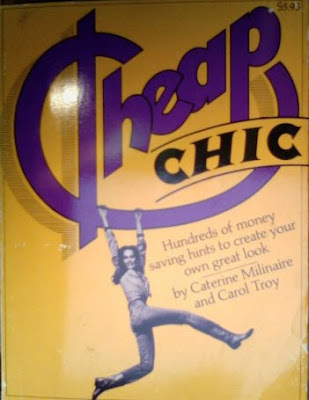 Glad to hear you still have your copy of CHEAP CHIC. Last I saw, it was $200. Hang in there and save those precious bits of history!